"The average stay of patients who arrived by ambulance and admitted as an emergency is 2.2 times the length of stay of the walk-in patients"
The emergency department is an essential component of the healthcare system. It is the frontline of acute care and a main route of admission to the hospital. The influx of patients into the emergency department is one of the most challenging problems hospital managers have to deal with. This influx requires sufficient staff and material resources. When these resources become limited, the patient flow results in overcrowding, which may lead to patients leaving without receiving treatment, lengthy waiting times and conflicts between disappointed patients and overloaded staff. 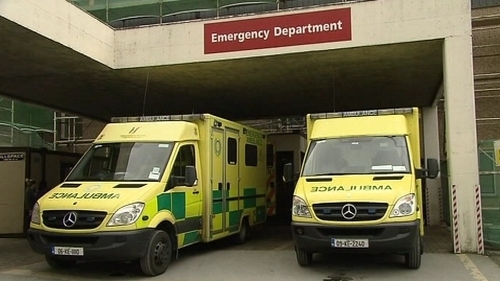 Irish hospitals are witnessing a significant rise in overcrowding in emergency departments. According to the daily trolley count by the Irish Nurses and Midwives Organisation (INMO), the overcrowding crisis in Irish hospitals reached a new record at the start of 2018 with more than 700 patients on trolleys. This is proof that the overcrowding crisis in Ireland requires immediate attention. The serious consequences of overcrowding make forecasting the demand in advance crucial for hospital managers. Mathematical sciences researchers and a hospital group have come together for the first time in Ireland to support decision making to relieve overcrowding. The Mathematics Applications Consortium for Science and Industry (MACSI) at the University of Limerick (UL), and the eHealth Division in UL Hospitals Group, led by Brian McKeon, are collaborating to analyse the University Hospital Limerick (UHL) data and the INMO trolley count figures. This research will give us a better understanding of the past, present and future situation of the overcrowding problem in Irish hospitals, particularly in UHL. Our research team at MACSI are using maths and statistics to develop models that enable us to forecast patient demand and estimate the patient length of stay in the emergency department. The mathematical model is based on the analysis of historical data and assumes that past data features and components can be used to predict the future. For instance, the data that we have obtained, have revealed some seasonal features. The numbers of patients unsurprisingly increase in the wintertime and decrease in the summertime, with a significant drop around Christmas. Sharp troughs represent the Christmas period with significant patient outbursts appearing in the New Year. These sharp drops are always followed by a sudden influx of patients right after New Year’s Day. There is also a weekly seasonality where the numbers peak every Tuesday or Wednesday. These periodic patterns were embedded in the mathematical model and allowed us to forecast patient demand. Our model, shown below, proved that the high records at the start of 2017 were predictable. Hospitals, the HSE and the Department of Health can use these models to support decision making for budget planning, staffing levels, and other plans around expected hospital overcrowding in winter. Predicting patient length of stay in A&R departments is vital because it is considered a reliable and valid proxy of measuring the consumption of resources such as available beds and staff. To estimate the length of stay, we designed a probabilistic model based on the so known "Coxian model", developed in 1955 by statistician David Cox. The model suggests that the total time spent in emergency can be broken down into multiple phases. Each phase may represent a stage of care (triage, examination, treatment, etc.) or simply a queueing time in the waiting room. Each patient is expected to spend some time in every phase before either exiting the emergency department or progressing to the other phases. The output of our model is an estimation of the average time that a specific patient might spend in every phase. The estimated length of stay also depends on such characteristics as the patient's age, gender, arrival mode, health state, severity of illness etc. For example, we found that the length of stay of patients who are over 65 years old is 1.8 times the length of stay of patients under 65. The model also showed that the average stay of patients who arrived by ambulance and admitted as an emergency is 2.2 times the length of stay of the walk-in patients. Moreover, the patients who are admitted to ward, their length of stay in the emergency department is 1.2 times the length of stay of other patients who were either discharged home or transferred to other departments; which is a sign of blockage or unavailability of beds in wards. Using this model will assist A&E managers in identifying patients who are most likely to have extreme lengths of stay and in predicting the forthcoming workload. This research from the unique collaboration between the eHealth Division in UL Hospitals Group and MACSI will support the management of resources and plan better for the future. Through this project, we are proving once again that maths is a powerful tool that is always able to solve our daily life problems. Jean Rizk is a Health Research Board-funded PhD researcher at the Department of Mathematics and Statistics at the University of Limerick.